There are some dishes which just swirl me back to the memory lane and remind me of all-the-good-old-care-free days, when every minute of my life was magic, when I was endlessly being pampered by my mother & her yummy treats. then, at that point of time, I was too young to realize how precious those days were. ...now, when I am a married woman and have a responsibility to take care of the family, I just wish atleast for a day there was a a time-machine which would transport me back in time, to those lovely days. In short, my mother's cooking fascinated me the most. Every Sunday, we used to eagerly wait for the Sunday issue of our favorite newpaper (it still is), especially for the dishes featured in the Ruchi Abhiruchi section. My mother had cooked countless number of recipes from there (because, we seriously didn't know about formal cookbooks in 1990's.). This was basically our Sunday ritual, for many many years. My mother never transferred any of the culinary duties to me or my sister, which means all we had to do was devour over all her dishes. But, once I moved to US, the first and foremost thing I missed was - those moments I spent with my family, which I understood will never ever come back. That is when, I took the matter in my own hands, started to cook by myself , taking careful instructions from my mom in the beginning and later venturing out on my own - from starting this blog to try to get inspired and cook new dishes in the limited amount of time I have in hand. 'Dahi' in Hindi means yogurt and 'Vada' is a fried lentil fritter. Just imagine what would happen if some creamy, delicious, fluffy lentil fritters are dunked in a unbelievably simple (not more than 30-45 seconds to put together) yet yummy yogurt sauce - pure heaven. This dish is made in almost every Indian household and is eaten as a guilt-free brunch/snack item, anytime of the day & especially during major Indian festivals. Recipe Source: the world's best cook, my mom. Step 2: Drain the lentils, put them in a blender with about 3/4 cup of water and chillies. Grind until its smooth paste-like batter. Season with little salt. (Remember, there will be salt in the yogurt sauce too, so add just a little or else the overall dish will be too salty). Step 3: Whisk the ingredients listed under 'yogurt sauce' in a medium-size bowl. Place it in the refrigerator, until the fritters are ready. Step 4: Pour oil in a wok or medium-size saucepan. Heat over medium-heat. A good test whether the oil is heat enough is to drop a pearl-like batter into the oil. If it puffs up to the surface, then it is ready. Step 5: Fill a medium-size bowl with hot water and place it just beside the stove-top. Now, carefully add 1 spoonful of batter into the hot oil, without over-crowding. After a minute or two, turn the fritter onto the other side, fry until golden brown and immediately drop into the hot water. Repeat this process for all the fritters. Note: Donot leave the fritters in the water for more than 3-4 minutes. The water-soaking will remove all the excess fat, making this dish almost guilt-free. Step 6: Lightly press each vada, between your palms, squeeze out the water. Make sure not to press too hard. Drop them into the yogurt sauce, dunking and coating evenly. Step 7: Sprinkle some extra chaat masala or cumin-coriander powder over the top. Garnish with cilantro leaves. Serve chilled. Sharmilee - so true. anything with yogurt tastes sooo good :). thanks for dropping by. Chandana - nenu bagunnanu. meeru yela unnaru? :). notyet100 - Advanced Diwali wishes to you too. 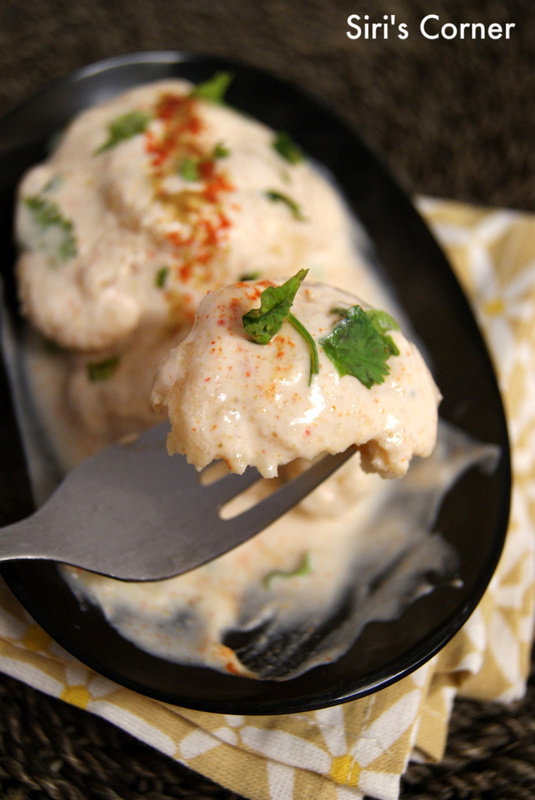 Very tempting dahi vada, irresistible..
Advanced Diwali Wishes to u n ur family..
My fave. dish. Lovely clicks. 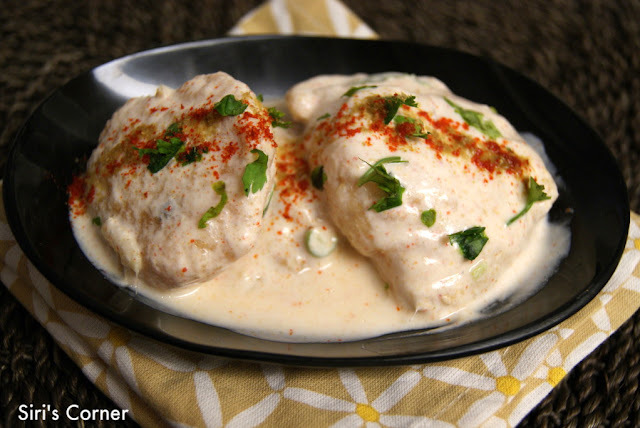 Hi Siri,Samr pinch..I love dahi vada and any time I go out to dine this is the first dish I used to order..Superb clicks! !